WATER….WATER…..WATER!!!!!!!!!!!!!!! Although a certain amount of sodium in the body is needed for it to function properly, too much can cause serious issues in pigs. My pig will not drink water! We hear this many times. Here are a few suggestions to change this…. Change the type of water you offer them. Get one of those filtration pitchers or some bottled water. If they drink that, I would suggest you change the water you drink as well. Add a bit of juice to the water, as small of an amount as possible, which they will still drink. Juices, like apple, pineapple, or grape are always a hit but you must take into consideration the amount of sugar and adjust the overall diet as necessary. Juices like lemon, cranberry, or orange are wonderful because they are also acidic and are great for the overall health of the pig. The same adjustments must be made to the overall diet. You can also try the flavored water drops designed for bottled water, most are calorie free. Put food into the water, but again, adjust the overall diet for the increased calories if necessary. You can float cheerios or some other such cereal. You can dice carrots and toss them in. Feed vegetables that are high in water content. Cucumbers, celery (if they will eat it), or romaine lettuce (NEVER iceberg, too much cellulous) are some good choices. In the summer months, freezes fruits and veggies into ice and give them as treats. Again, adjust the overall diet for the increase in calories if needed. Soak pellets to increase hydration/water intake. Soaking them has a couple of benefits, 1. It causes them to swell allowing your pigs belly to feel fuller faster versus having to rely on them drinking water to get them to that state and 2. Obviously, this provides additional water in their diet. My pig will drink water, BUT, the bowls are always empty. Use tip proof bowls, if your pigs are outside and they tip over anything you try to use. Get a kiddie pool and make sure there is fresh water put in there everyday. If your pigs bowl is frequently empty when you return home, get a bigger bowl. Scatter several bowls throughout your yard if you need to so there is easy access to fresh water at all times. Put the water in a container sunk into the ground so that the pigs can't crush or smash it up. 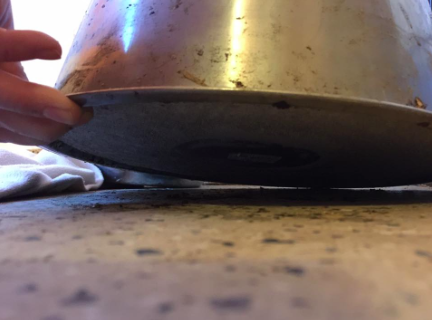 Add concrete to the underside of your water bowls to make them much heavier so it is more difficult for your pig to tip. Be sure to make accommodations in the summer and winter months. Use ice cubes or frozen fruit to add to the water bowl for the hotter months to keep the water cool and a heated water dish in the winter time for those pigs that are outside. Water deprivation doesn't only happen in the warmer months, it also happens in the cold months when water bowls are frozen and no fresh water is available. Salt poisoning through diet: A little salt is needed for proper body function but any good pellet will have the correct amount already included. Those chips, that popcorn and other salty human treats? Well, one or two will not cause a problem as long as they have a water supply, but please find treats that are healthier overall. This problem is caused when your pig gets into something they should not like dog food or especially chicken feed. The salt makes them thirsty, they drink, and drink and they over drink. Salt poisoning through dehydration/water deprivation: This is the major cause of salt poisoning! 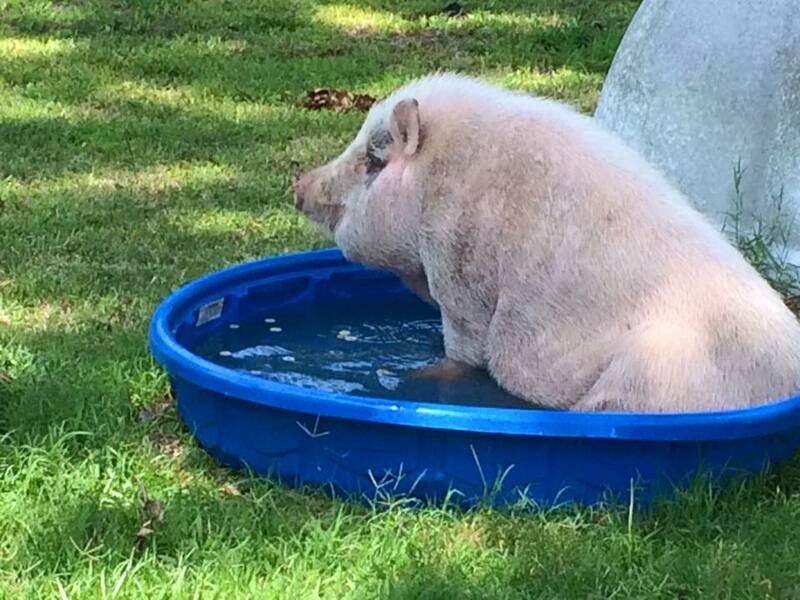 When your pig cannot or will not drink water it is not a matter of if, it is a matter of when. Again, clean fresh water should be available at all times. When they finally get water, they drink excessive amounts and that is what causes the neurological symptoms. Some pigs will press their heads against a wall and just stand there. Nose twitching and possibly a convulsion to follow/seizure. Seizures can present in different ways. There are different degrees of severity when it comes to seizures, some have the classic type where they’re thrashing around and others may present more subtly such as a trance like state. Click here to read more about seizures in mini pigs. Treatment: This is the same for either type of salt/sodium poisoning. Call and advise your vet of the situation. If possible, take them in for treatment. First, your veterinarian will want to remove as much excess salt as possible. This is accomplished by one or more of the following: inducing vomiting, gastric lavage, enema administration. What method(s) used to decontaminate depend on the patient's overall health, time after ingestion, and other clinical signs that may be present.Your vet will need to slowly rehydrate and correct any electrolyte imbalances. Your vet will want to monitor blood levels to correct the cellular shift caused by the salt. Your veterinarian may prescribe slow administration of Hypertonic Dextrose or Isotonic Saline solutions. Time is very important to the success of this treatment. If you cannot immediately take them to a vet………….. Immediately give them ¼ cup water (this is for your average size pig, 80 -120 pounds. You must adjust the amount for smaller pigs!!! Smaller pigs must get less water!!!) Do NOT give you pig as much water as they want to drink. Wait 20 – 30 minutes and give another ¼ cup of water. Again, adjust for size. Continue this until the pig no longer shows interest or no longer drinks. Wait an additional hour and then return to having a constant supply of fresh clean water available. Brain damage caused by salt poisoning may or may not be permanent. This depends on how swollen the brain and how quickly it is returned to normal size. The mechanism of toxicity of water deprivation and intoxication is related to electrolyte imbalance associated with dehydration. During the initial dehydration phase, there is an osmotic loss of water from the brain secondary to an increased blood sodium concentration. This is followed by an influx of ionic sodium, potassium, and chloride into the brain, which inhibits anaerobic glycolysis. When rehydration is delayed past the initial phase of dehydration, there is an influx or production of organic molecules, such as amino acids, polyols, and methylamines. These osmoles result in cell swelling upon rehydration. The osmotic differential cannot be equalized quickly enough to prevent edema of the brain.